Members of The Doors Hear Dubstep For The First Time, And The Looks On Their Faces Says It All…. Modern day music has changed so much. New genres have popped up, people don’t always need to know how to play instruments and sometimes you don’t even have to know how to sing. Two of the most popular genres in today’s day and age is electronic dance music and dubstep. Dubstep is a form of electronic music that normally will have deep bass drops. Fun Fact: Dubstep originated in South London, England. One of the most popular dubstep artists is Skrillex. Prior to turning into a DJ, Skrillex (also known as Sonny Moore) was in a rock band called From First to Last. Growing up a rockstar, he was inspired by many classic rock bands. So, he decided to bring in members of The Doors to sing and play drums on a track. 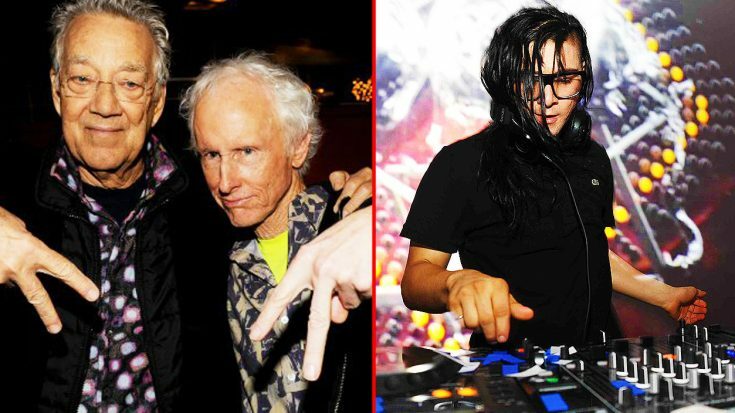 Skrillex dug up some Jim Morrison vocals and had instrumental contributions from John Densmore, Ray Manzarek and Robby Krieger. He invited Manzarek and Krieger to come down to the studio and listen to the song as it was being completed. When he plays the track for the two members, they are pretty confused. They look uncomfortable, and you can tell that they aren’t really feeling the music! But, eventually they begin to work and add some of their own flair, which makes the song sound 10 times better. The whole encounter is pretty funny, and just proves that these classic rock artists aren’t too impressed with the current electronic music! Check out the funny moment down below, and let us know what you think!